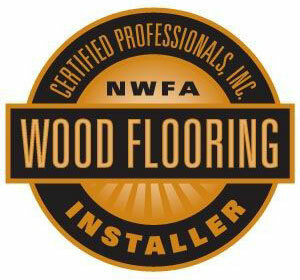 Chicagoland Flooring is Certified Professional Wood Flooring Installer. This certification is a way of validating the industry knowledge and expertise. We are NWFA recognized expert in the field and you can trust that we will get the job done right. Installation of hardwood floors planks, strips and parquet - mosaic from new and recycled wood, on subfloors from wood or concrete and concrete with wood (plywood or sleepers - various thickness and widths, as needed); also, installation of acrylic impregnated hardwood floors. Installation of standard and custom - made hardwood floors or based on our suggestions. Installation of solid and laminated wood floors- unfinished and prefinished = square or beveled (micro or full) edges/ends - plain, rift, or quarter sawed - install by 3 methods (nailed - stapled, glued, floating). Installation of floor from high-pressure melamine laminated prefinished material (Pergo, Wilsonart, Traffic Zone and others) - install by floating only (special NWFA installation required). Installation of hardwood floors if different grades, thickness (5/16", 3/8", ½", ¾", 33/32" and others), widths (including random patterns), lengths (including random patterns). Installation of hardwood floors from a variety of woods: Amazon-exotics, ash, beech, birch, cherry, hickory, mahogany, Brazilian cherry, maple, pine, poplar, purple, red cedar, red oak, teak, walnut, white oak and others. Installation of decorative strips, borders, medallions, patterns, inlays, below-grade installation, and installation of pegs (walnut, oak, etc.) stone/ceramic/marble, brass, and glass in wood and others. Installation of radiant wooden heat vents set flush into floor, with or without damper, and radiant wooden heat vents dropped in, with or without damper - all woods and sizes. Installation and exchange - all kinds and woods - of base-shoe - quadrant, baseboards, thresholds, reducers, safe glides felt protectors for furniture and others.